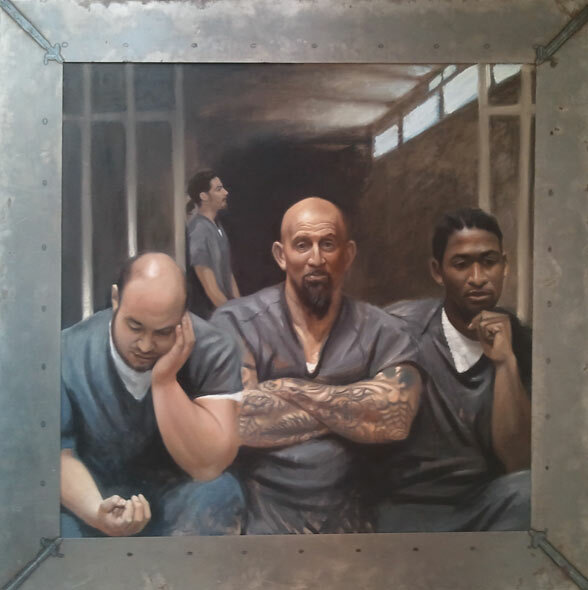 WSOAE Exhibitor Kevin McEvoy will have one of his large oils, “Prisoners,” on display at a show organized by Allison Malafronte, former senior editor of American Artist, at the CPW25 Gallery, running November 15th through 27th. The show is entitled “Converge: Where Classical & Contemporary Art Converge. Some 30 up-and-coming artists are highlighted. Kevin, who lives in Islip, L. I. and has a studio in Riverhead, teaches art every few weeks at the Suffolk County Jail. His painting , “Prisoners,” derived from this work. The oil on linen painting is 60” x 60” and is set off by a wide customized metal frame that was put together in collaboration with a local welder. McEvoy’s success in teaching art at the Suffolk County Prison has been written up in feature articles appearing in L.I. Newsday and other local publications.